Abandoned bikes like this one will soon become a thing of the past on Roosevelt Island. In August, The Daily relayed concerns reported by a reader, Eduardo Jany, about abandoned bikes clogging up limited available spaces on the Island. PSD chief Jack McManus responded with a promise to unveil an aggressive policy in September. He kept that promise. The results so far are an unqualified success. Abandoned bikes reported by Eduardo Jany instigated RIOC's refreshed interest in attacking the issue. "We have started to enforce it," Public Information Officer Alonza Robertson tells The Daily. "We have removed all unusable bikes by 591 Main, Firefighter’s Field and the RI Subway Station. They are being stored at the warehouse for the next two weeks, then will be discarded. We will finish the Helix area next week." But the initiative has not stopped there. "RIOC crews just finished clearly the Helix area today literally removing a truckload of bikes, 18 to be precise. We’ve also tagged another 15 bikes to be moved by November 1." What about abandoned bikes we still see scattered around the Island? "It's quite possible that we simply haven't gotten to that particular bike yet," added Chief McManus, "or maybe I evaluated it and it didn't fit within the parameters." 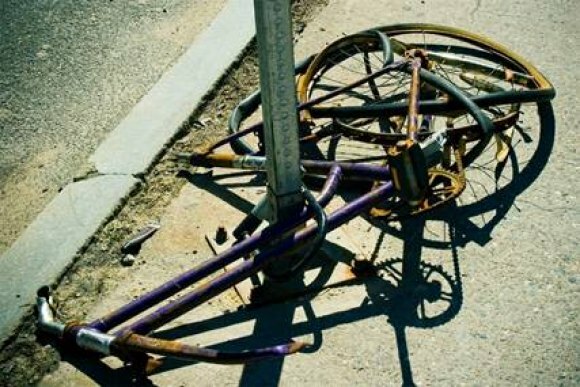 McManus suggests contacting Pubic Safety if you spot a bike you believe is abandoned. "Describe the bike and where it is" and PSD will check it out.